A monotypic genus of central Asia. Cannabis sativa L. Sp. PI. 1027. 1753. An annual branching herb, 3°-10° tall, the inner fibrous bark very tough, the branches nearly erect. 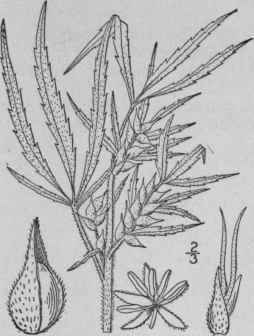 Leaves divided to the base, the segments lanceolate or linear-lanceolate, acuminate at both ends, sharply and coarsely serrate, 3'-6' long, 1/4'-l' wide; staminate panicles narrow, loose, peduncled, 3-5' long; pedicels filiform, bracteolate, 1"-3" long; pistillate spikes erect, leafy-bracted, 1' long or less in fruit; achene crusta-ceous, ovoid-oblong, about 2" high. In waste places, New Brunswick to Ontario and Minnesota, south to North Carolina, Tennessee and Kansas. Widely distributed in all temperate regions through cultivation, and occasionally a troublesome weed. Native of Europe and Asia. July-Sept. Gallow-grass. Neckweed.